Making the decision to start therapy is not always an easy one. Whether you are here in hope, pain, excitement or fear, or all of these feelings at once, I welcome you. If you are searching for a fully qualified, deeply experienced counsellor and psychotherapist who will help you to get the results you want, you are looking in the right place. With over twenty years’ experience of working successfully with clients, I believe with every therapy a difference is made not only to the client themselves but also future generations. Life is a journey which can be complex and challenging. Are you feeling stuck or alone, confused or on edge? Do you want to loosen the grip of anger, depression and unhelpful patterns, or to heal your relationship with a loved one? Do you want to free yourself from the legacy of childhood abuse? Or are you looking to increase your self-awareness, nurture your creative potential, and increase your level of happiness? For more information on how counselling therapy can help you, please visit What is Counselling and Psychotherapy? 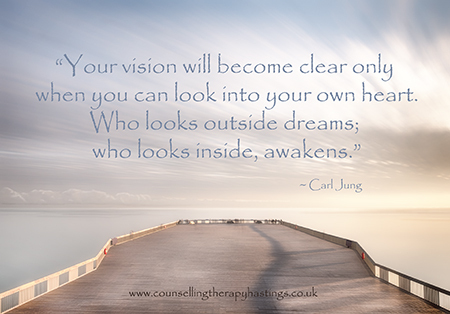 Since I began my counselling career in 1997 I have worked and studied in-depth to gain extensive knowledge and insight in the field of counselling and psychotherapy. Further information on my professional background can be found on the About Deborah Bennett page. As a fully qualified, insured and registered member of the British Association of Counselling and Psychotherapy (BACP), I adhere to their code of ethics and practice, providing clients with the assurance that they will benefit from the high standards of professional excellence required by this organisation. For more information please visit Links & Books. I am also registered with the (UK) Counselling Directory. To book an appointment or if you wish to discuss how counselling and psychotherapy can help you please contact me at EnergyWorks Clinic on 01424 425664. General information for prospective new clients, including fees and about what to expect can be found Here.